* Know what you want your dog to do. Set both short-term and long-term goals. * Find a technique that is comfortable for both you and your dog, and then stick with it. Don’t change techniques each time something doesn’t work; you and your dog will both be confused. * Give a command only once. If you repeat the command over and over, which one should he listen to? The first or the sixth? * Show your dog exactly what you want him to do, help him do it, and reward him when he does it correctly. * Timing is critical to success. Praise your dog as he does something right. If you use corrections, let him know as he makes a mistake. * Remember that any behavior that is consistently rewarded will be repeated. 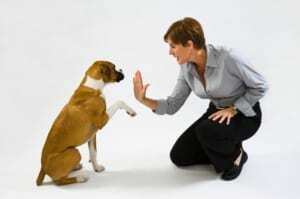 * Praise or corrections after the fact are not effective and can confuse your dog. * Consistency is important – in your training and in enforcing the rules you have established. * Always finish training sessions on a high note. Have the dog do something well and then reward him for it. Training is a learning process for both you and your puppy. Don’t rush it; take your time and watch your dog. When he’s confused, worried, or fearful, take a break and think about what you’re doing. Why is your dog reacting the way he is? How can you communicate with him in a better way? When he does get it, don’t be stingy with the praise! Shop only the best for you and your pets! Beloved pets are family, after all. Celebrate the unconditional love of dogs and cats with funny, beautiful, and unique gifts for pet lovers. Our pet shop is built for and by passionate pet lovers and features high quality, organic and all natural gifts for dog and cat lovers. We support eco-friendly, homemade, all natural, and made in the USA products for your dogs and cats. Feel free to contact us with any questions or feedback. Dog decor and cat decor to inspire pet lovers! Check out our large collection of dog art with dog quotes, funny dog quotes, famous dog quotes, dog sayings, dog wisdom, motivational quotes, and more. We also offer cat art with cat quotes, funny quotes, or inspirational quotes. In our online pet shop, you’ll find high-quality art and decor to celebrate your love for dogs and cats. Always make time for play! We know important play is — which is why we offer dog toys and cat toys too. Your pets are your family, friends, and inspiration. We hope you find treasures to remind you of your fun, funny and beloved pets — and their unconditional love! For a wonderful article on Cat vs Dog, check this great site out! You will love it! First-Time Pet Owners! Great info here for you! Does Your Dog Like Fruit…Only a few a good for them! What Vegetables Can Dogs Eat?